This never-ending winter has been a bit challenging between school cancellations and being cooped up indoors trying to keep the kids busy, so I'm a bit behind on telling you what's new over here at Elizabeth Victoria Designs! Spring cannot come soon enough!!! So anyway, here's a few things that have been going on over the past few months…PaperStyle.com has been very good to me! I've been featured in their email campaigns for the past three months as well as the header on their home page which highlighted my designs for the famous movie, A Christmas Story. The latest one came yesterday and features not one, but TWO of my bridal shower invitations, Colorful Bride and Krafty Wedding. Super exciting! 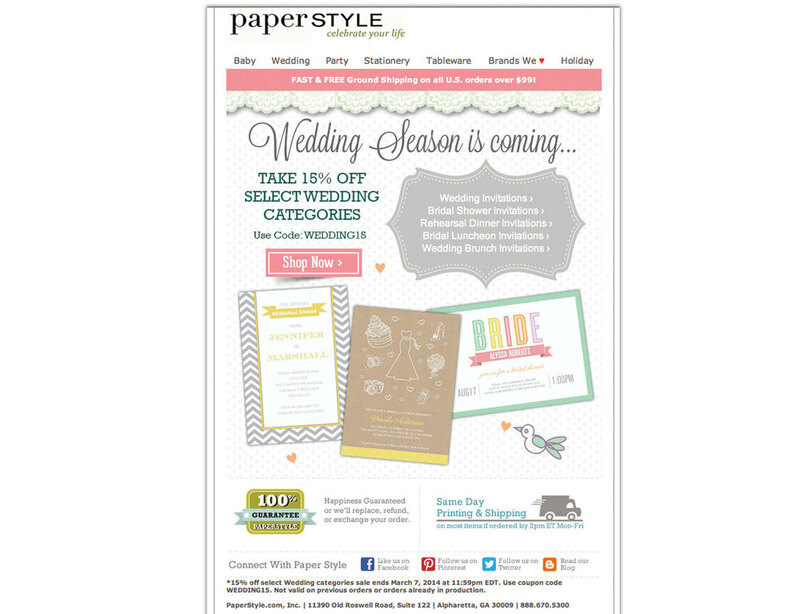 The two invitations are below and you can click on them to purchase directly through PaperStyle.com. To view my other email campaigns and home page advertisements, click here to view them on my Press page. Hope everyone is surviving this crazy Polar Vortex! And as always, thanks for visiting!